Place the smaller side of the Cliff Pedestal A on the Ocean Board B , using the long and short tabs on the Cliff Pedestal to guide assembly. Place the Island Board C on top of the Cliff Pedestal A , again using the long and short tabs to guide assembly. The youngest player is the Start Player, who begins by placing 2 Workers D of their chosen color into any unoccupied spaces on the board. 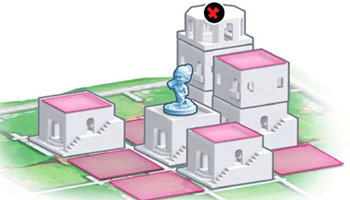 The other player(s) then places their Workers E.
Players take turns, starting with the Start Player, who first placed their Workers. On your turn, select one of your Workers. You must move and then build with the selected Worker. Move your selected Worker into one of the (up to) eight neighboring spaces. A Worker may move up a maximum of one level higher, move down any number of levels lower, or move along the same level. A Worker may not move up more than one level. The space your Worker moves into must be unoccupied (not containing a Worker or Dome). 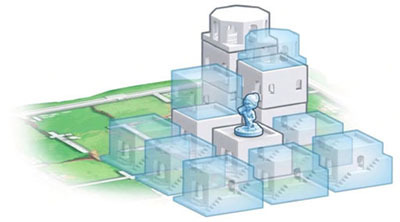 Build a block or dome on an unoccupied space neighboring the moved Worker. 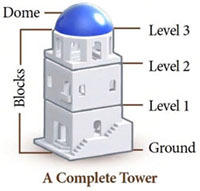 You can build onto a level of any height, but you must choose the correct shape of block or dome for the level being built (See diagram to the left). A tower with 3 blocks and a dome is considered a "Complete Tower". If one of your Workers moves up on top of level 3 during your turn, you instantly win! You must always perform a move then build on your turn. If you are unable to, you lose. You are now ready to play the base 2-player game! We strongly suggest you play several games using only these rules. Read on when you are ready for more! Once you've played a few 2-player games using only the rules on the front page of the rule book, we suggest you try God Powers. God Powers are cards that provide you with a powerful ability A that can be used throughout the game. Many God Powers change the way Workers move and build. The Challenger (determined by who is the most "god-like") chooses God Powers equal to the number of players. If playing a 3 r 4-player game, ensure all chosen God Powers are compatible with the number of players B. All God Powers are playable in 2-Player games. The Challenger reads each selected God Power aloud from the rule book. Refer to the set icon and index number C to find each God Power description. In clockwise order, everyone chooses a God Power and places it in their area. The Challenger receives the last God Power. 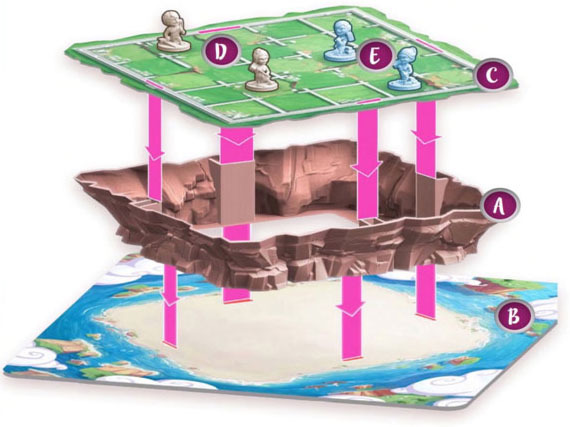 The Challenger chooses a Start Player, who places 2 Workers of their chosen color on any unoccupied spaces on the board. In clockwise order, the other players each place all their Workers. Normal Rules and conditions still apply to you when using a God Power, with the exception of the specific changes described by the God Power. You must obey all God Power text that says you "cannot" or "must", otherwise you lose the game. Domes are not blocks. If the God Power description states it affects blocks, it does not affect domes. "Forced" is not "moved". Some God Powers may cause Workers to be "forced" into another space. A Worker that is forced, is not considered to have moved. 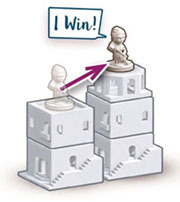 Remember: to win the game by moving onto the third level, your Worker must move up during your turn. Therefore, if your Worker is Forced onto the third level, you do not win the game. Moving from one third level space to another also does not trigger a win. God Powers apply or are triggered at a specific time, according to what is stated at the start in the God Power's description. For example, Apollo's God Power description starts with "Your Move". 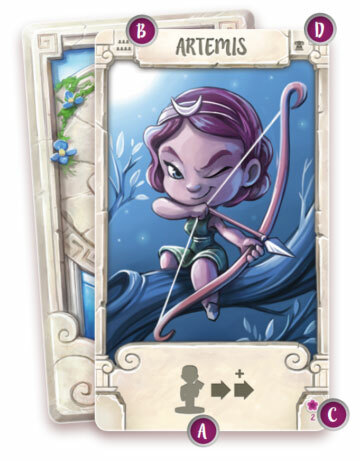 This means if you possess Apollo's God Power, it can only be used by you during the "move" phase of your turn. When using a God Power, all text in its description is written from the perspective of the player possessing the God Power. Any time an "opponent" is mentioned in a God Power description, it is referring an opponent of the player possessing the God Power. Additional Setup must be performed when using some God Powers. If your selected God Power features "Setup" text in the description, execute these special instructions during the game Setup. If the order players perform additional setup gives either player an advantage, execute them in turn order. Additional Win Conditions are specified by some God Powers. 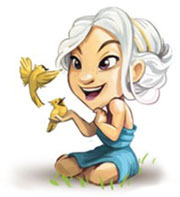 In addition to being able to win by moving up onto the third level during your turn, you can also win by fulfilling the "Win Condition" described. Many God Powers feature a icon D to indicate it can be used in Golden Fleece variant (Golden Fleece Expansion sold separately). For more information, see the Golden Fleece section. For the first few games you use God Powers, we strongly suggest using the Simple God Powers below, indicated by the hibiscus flower. Your Move: Your Worker may move one additional time, but not back to its initial space. Opponent's Turn: If one of your Workers moved up on your last turn, opponent Workers cannot move up this turn. Your Build: Your Worker may build a dome at any level. Your Build: Your Worker may build one additional time, but not on the same space. Your Build: Your Worker may build one additional block (not dome) on top of your first block. Your Turn: If your Workers do not move up or down, they may each move any number of times (even zero), and then either builds. Your Move: Your Worker may move into an opponent Worker's space, if their Worker can be forced one space straight backwards to an unoccupied space at any level. Win Condition: You also win if your Worker moves down two or more levels. Your Turn: If your Worker does not move up, it may build both before and after moving. Titan Benefactor of Mankind Your Turn: If your Worker does not move up, it may build both before and after moving. Check here for the Advanced Gods. 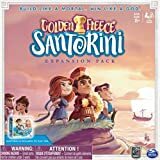 Check here for the Golden Fleece Gods and Heroes. 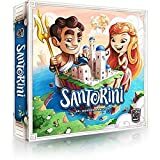 Santorini is best as a 2-player game. However, we have included rules for 3 and 4-players for those times when you really want to play with more people. Setup For 3 and 4-player games, you must play with God Powers. 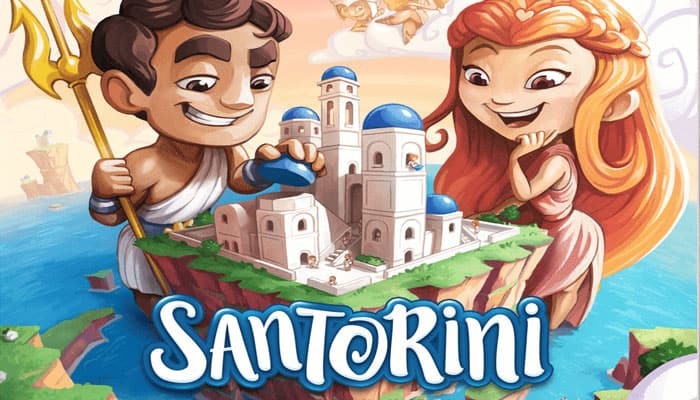 When selecting which God Powers to play with, they must all feature a icon when playing a 3-player game, or a icon in a 4-player game. 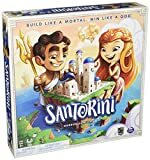 If you lose in a 3-player game, immediately remove your Workers, Tokens, and God Power from the game. If only one player remains, they are the winner. You play in teams of 2 players, who share control of 2 Workers. Teammates must sit across from each other (teams alternate turns). Each player has their own God Power. You cannot use your teammate's power. During setup, your team's first player places the Workers. Your team's second player takes the first turn. If any player wins, their team wins. If any player loses, their team loses. Block: A part of a tower and forms a space on the board. When you build, place blocks from largest to smallest so that they stack. For reference, see the "Complete Tower" diagram on the front page. Complete Tower: Consists of exactly three blocks and a dome. Dome: The top level on a Tower. Domes cannot have anything placed upon them. A dome may onlt be built on top of the third level, unless otherwised specified by a God or Hero Power. Neighboring: Each space has up to eight spaces surrounding it. These are called its neighboring spaces. Occupied Space: A space containing a Worker or dome. Perimeter Space: One of the 16 spaces along the edge of the board. Token: A marker specific to a God or Hero Power. You cannot place a Token onto a space that is occupied or contains another Token. Remove Tokens from the board when blocks are placed upon them. Unmoved Worker: A Worker that did not move on your turn. Unoccupied Space: A space not containing a Worker or dome.